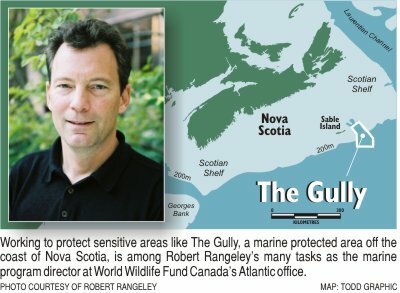 ROBERT RANGELEY takes a holistic approach to marine conservation in Atlantic Canada. Balancing the pragmatic with the political, he says efforts toward integrated oceans management must keep fishermen, bureaucrats and shipping industry executives in the loop, so all parties are working toward common and sustainable goals. One example is his efforts to secure a network of Marine Protected Areas (MPAs) to preserve biodiversity and healthy fisheries. Rangeley became the marine program director at World Wildlife Fund Canada's Atlantic office in Halifax, Nova Scotia, when it opened about five years ago. He received a Ph.D. from McGill University. A marine ecologist for 20 years, he also was a research biologist with Canada's Department of Fisheries and Oceans. His field research has focused on seaweed, invertebrates, fish and seabirds in the near shore waters of the Bay of Fundy, Gulf of Maine and the Gulf of St. Lawrence. The Gulf of Maine Times recently interviewed Rangeley about his work on integrated oceans manage-ment, mapping in the Gulf of Maine and Scotian Shelf areas, and long-term exploitation of the Bay's resources, including the issues of oiled seabirds, bycatch and noise pollution. Q: One of your short-term objectives is to protect sensitive areas like the Gully off Nova Scotia, which became Canada's second MPA in 2004. How is the MPA working? A: The Gully was initially brought forth as an area under protection for Northern bottlenose whales, which were known to be at risk. Since then the whales have been listed as endangered under the Species at Risk Act in Canada. As investigations proceeded around the Gully, it became clear it was of value for more than just the whales. It actually has a number of unique properties, such as a highly productive upwelling area contributing to fisheries on the shelf as well as a high diversity of cold-water corals. One issue is that the rate at which industry gets permission to do things far outstrips the rate at which we can actually assess their impacts, take appropriate management action and put in place conservation. So at the same time the Gully was a candidate MPA, everything went on as usual. They did close some fisheries during the candidate stage, but the oil and gas industry continued to take out leases around the Gully that allowed them to conduct seismic activity like exploratory drilling for natural gas. And remember what the Gully was important for: bottlenose whales. Those kinds of diving, beaked whales are most sensitive to loud noises. They see, emit noise and hunt in their acoustic environment, and yet we allowed seismic activities that basically put a big lasso around the Gully. So by the time we get stuff in place, a lot of these areas are already committed, and we've lost the opportunity to protect them. Q: Can you prevent the oil and gas companies from operating in the Gully? A: That's interesting. They can't do anything in the Gully. They're restricted from doing things that are demonstrably impacting the Gully. However, the seismic part of that equation has been very controversial in terms of what the effect is on whales within the Gully. Q: What is the effect? A: It all depends on the sound levels. The best example of impact to marine mammals - porpoises, dolphins and beaked whales are the most vulnerable - has been the high-energy sonar that the U.S. military uses. In that case the impacts are death and physiological damage, like bleeding from the ears. That's the worst-case scenario. With lower-level seismic activity there is some evidence of that kind of physiological damage. But there's also the impact on their acoustic environment, and how social and feeding activities are disrupted. There could be stress on a population that already is a stressed population. They're endangered. All the evidence is that seismic is not good for marine mammals. The question is how close you can get without messing them up. A kilometer (.62 miles) seems to be bad. But we have very little knowledge on further afield effects. This remains a big, ongoing debate everywhere, certainly around the Gully. Q: Did you learn any lessons about MPAs from the Gully? A: I think the lesson we learned is that if we're going to take the effort to protect areas in that sort of ad hoc, one site at a time, manner, a lot of things are going to fall through the gap. It's not the best approach for conservation and it's not the best approach for industry. What industry hated was the fact that the Gully seemed to pop up out of nowhere as an MPA. They saw it as kind of a slippery slope, and were wondering where the next one was going to be. That took us down the road of systematic planning for MPAs. And that led us to undertake a mapping project for the Scotian Shelf and all of the Gulf of Maine in Canada and the U.S., and the seascapes. Q: Has the mapping project already produced some target areas for protection? A: I can't tell you what's going to emerge yet. We can rattle off a few areas we know are important coral areas, but we're a long way from having the map of where they all are. Many of the coral areas that have been discovered already have suffered extensive damage. We can talk about protection of habitats in many different ways. We can have anything from zoning, where activities are regulated but still allowed, to a fully protected MPA, where no activities are allowed. The main message is that we have to undergo marine protection in a way that takes into account habitat, ecologically significant or sensitive areas and connectivity. That means networks of MPAs that are planned in advance. Until you plan first you're just creating conflicts, you're creating damage, you're preventing recovery of species at risk and you're doing untold amount of damage that no one is even measuring. Q: Who will benefit the most from the mapping project? A: I don't think there's any way we can have a society that is using and exploiting resources unless we plan our activities. In terms of those industries that are dependent on renewable resources, the natural resources, the fisheries, for example, can only benefit. In the long term you cannot argue against a healthy ocean and the contribution of biodiversity to a healthy ocean. That will benefit anyone who has relied on clean oceans, healthy ecosystems and robust and natural states of biodiversity. Probably the biggest lesson we've learned in terms of trying to map biodiversity and trying to map physical and oceanographic habitat is how much we don't know. This is a relatively data-rich area in terms of the marine system relative to other places in the world, and yet there are huge gaps. Q: What types of activities are you undertaking to reduce the impact of long-term exploitation of the Bay of Fundy and surrounding waters? A: One of our focuses has been on bycatch. What we find extremely disturbing is the fact that bycatch is continuing to contribute to the decline of species even if a fishery is closed. It can be incidental or by illegal fishing. One of the tools we've put forth is zoning, part of which is setting aside some closed areas. And a lot of innovation still can be done on fishing gear. We have our International Smart Gear Competition, which was launched last year and carries a US$25,000 grand prize. What's neat about this opportunity is it fosters a positive approach to solving problems. It's fishermen engaged in coming up with the solutions. Q: What about other problems, like the bilge oil that can kill seabirds? A: Oil's bad, but bilge oil is probably worse for a couple reasons. One is that it�s a chronic source of pollution. And it's illegal, so if it's discovered, it's usually too late to clean it up. It's extremely toxic, more than oil because there are detergents, lubricants and other things in it. The ships let out this bilge oil at night when no one is around. It creates a slick that can be thousands of meters or even kilometers long. That's a relatively low volume of oil compared to what you'd envision with a tanker breaking up. But it's out at sea, and in the winter it's particularly bad because many seabirds overwinter out on the banks. A small amount of oil, only the size of a 25-cents piece, is sufficient to break down the insulation of their feathers. It's like having a dry suit with a whole punctured in it. The birds get cold and they go into hypothermia or they use up energy to keep warm and end up basically starving to death. One estimate of a small area off Newfoundland was a mortality of 300,000 seabirds. These are mostly seabirds like murres, puffins and razorbills that are repeatedly diving into oily water. One of our approaches is to push for stronger legislation. In the U.S. the fine levels are pretty high and enforcement is pretty good, so ships have tended to dump oil in Canadian waters. We now have a new amendment to our laws that allows greater fines and punishment of those that do it. When we ramp up efforts for enforcement we need to monitor more effectively as well. One of the monitoring tools that's pretty exciting is radar satellite technology. The satellite is called Radarsat II, and the program in Canada is called ISTOP (integrated satellite tracking of polluters). Hopefully we can gather data and track to a ship by what it left in its wake. For more information contact Robert Rangeley at RRangeley@wwfcanada.org or visit the World Wildlife Fund Canada Web site at www.wwf.ca/.